Planned Parenthood has finally released its annual report for 2015-2016. Nearly five months late, this report is the first glimpse of the impact of The Center for Medical Progress’ (CMP) undercover investigation into the abortion corporation. The results aren’t pretty. Planned Parenthood takes pains to claim the CMP videos were “heavily edited” and discredited (this is not correct, as shown here). And then the abortion corporation declares: “We fought every attack — and we won.” This is not an accurate statement, either, since a congressional panel has since investigated the abortion chain, and there are several outstanding criminal referrals Planned Parenthood is facing. At the heart of the report is all the hearts that were stopped and the lives that were taken — all while taxpayers fork out over half a billion to America’s largest abortion corporation. Here are four important things you need to know about Planned Parenthood’s new report. 1. Contraception is down, but abortions are up. Planned Parenthood claims that contraception is the answer to reducing abortions. Its campaign to ensure every woman could have contraception with no co-pays hinged on the argument that if people wanted to reduce the abortion rate, they simply needed more contraception. Yet despite Planned Parenthood’s own rhetoric and talking points, its latest annual report shows the abortion chain’s priorities were much different. Abortions went up and contraception went down. In 2014-2015, total contraception ‘services’ were 2,945,059. In 2015-2016, the total lowered to 2,808,815. Yet, in 2015-2016, Planned Parenthood used abortion to end the life of 328,348 preborn children — an increase from 323,999 children in 2014-2015. Instead of increasing its dispersion of contraception as Planned Parenthood claimed was most important for women, it managed to lower its contraception services, while increasing abortion. Further troubling about the contraception numbers is that over 27% of that (767,830) went to “Emergency Contraception Kits.” As Live Action News reported, emergency contraception can actually cause abortion. While not every woman who takes emergency contraception is pregnant, any pregnant woman who does may abort her baby. It’s clear by Planned Parenthood’s own admission that 328,348 more babies never got to breathe their first breath outside of the womb. 2. Planned Parenthood’s non-pregnancy-related health care services are too small to justify its funding as a legitimate comprehensive care provider. Meanwhile, as Planned Parenthood defends abortion as a necessary medical need, it also touts itself as a “comprehensive” health care provider, deserving of its half a billion dollars of government funds. It continues to claim it may be the only health care provider some women have. But the new annual report shows that Planned Parenthood is actually a bad thing for women. An important section to note is called “Other Services.” It’s here that the abortion corporation reports on its other actual medical services, not related to pregnancy, that legitimate health care facilities also provide. This is one of the main ways Planned Parenthood justifies receiving the same funding as a rural health clinic, for example. This part of the report includes those services that Planned Parenthood claims it provides as “comprehensive health care” to people and should continue to receive government funding for. For all the media spin on how Planned Parenthood is necessary for primary health care services, of the 9.5 million services the abortion corporation self-reports that it performed in the 2015-16 fiscal year, less than 40,000 of those services were family practice services. In fact, as it says, it treats more urinary tract infections than it does all family practice related services. For many patients, Planned Parenthood is their only source of care and our health centers are an irreplaceable component of our country’s health care system. This is important because when the issue of defunding Planned Parenthood arises, legislators talk of redirecting much of the money from the abortion corporation into local community health centers. It’s clear from Planned Parenthood’s own report that its money would be much better utilized in community health care centers. Planned Parenthood is on the same government payroll as many actual health facilities that are doing comprehensive health care. Yet Planned Parenthood is doing a negligible amounts of those services, and not carrying its own weight. If the money Planned Parenthood receives goes instead to other legitimate health centers, they will be able to provide even more comprehensive care to people. Most of them also provide contraception, well-woman exams, STD testing, and the other medical services apart from abortion that Planned Parenthood provides. 3. Planned Parenthood’s name remains misleading, as it cuts prenatal care and barely touches adoption. Potential parenthood results in a variety of choices in this nation: birth, parenting, adoption, or, tragically, abortion. However, there’s only one focus for Planned Parenthood, abortion. It’s own annual report makes this clear. Adoption: Planned Parenthood lists its negligible number of adoption referrals in its “Other Services” section of its report, rather than with its pregnancy-related services. However, the number of adoption referrals it does is so small, it’s virtually irrelevant in analyzing the data. Another note on its adoption referrals is that they are just that, referrals, to other places if parents want to place a baby for adoption. Prenatal Care: Likewise, Planned Parenthood continues to show it has little interest in prenatal care. As a recent Live Action investigation shows, the abortion giant doesn’t actually help women who want prenatal care. This annual report shows Planned Parenthood provided 9,419 women with some sort of prenatal care (contrasted with 328,348 abortions). In this one year, Planned Parenthood cut its prenatal care services nearly in half. As Live Action’s investigations have shown, most of what Planned Parenthood does with both prenatal care and adoption is send women somewhere else. It continues to show it has no interest in helping to facilitate all the choices related to parenthood. Yet Planned Parenthood still checks the box to show it provides just enough of these services to claim them in talking points and when it’s campaigning for taxpayer funds. 4. Planned Parenthood is still rich. 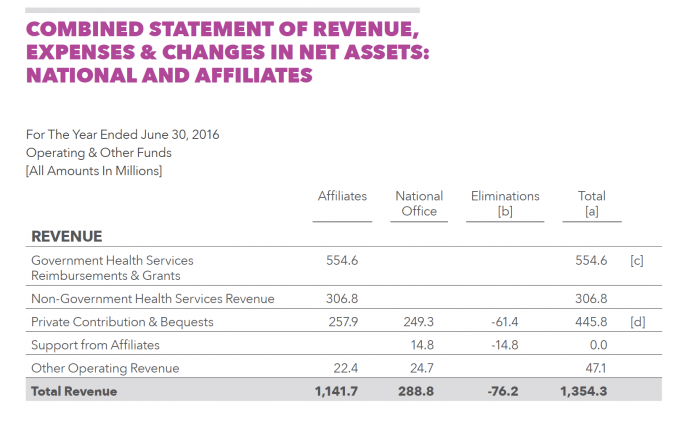 Finally, as its own report shows, the abortion corporation is not suffering financially. In its previous annual report, it reported receiving $553.7 million in taxpayer money. Last year that number rose again, to $554.6 million. More than half a billion dollars of taxpayer money is going to a fringe ‘medical provider’ who does small numbers of medical services, commits hundreds of thousands of abortions, and has been referred for criminal charges by a congressional committee. This should trouble every taxpayer, regardless of his or her stance on abortion. Clearly such practices cannot be in the best interest of poor and uninsured Americans needing comprehensive medical care. America’s abortion corporation is still raking in the big bucks while taking the hard-earned money of American taxpayers. The average American gets little in return. Ironically, Planned Parenthood’s own annual report reveals the greatest evidence of why it should be defunded. Whether it’s the lack of actual medical care, the rise of abortions, the cuts to contraception and prenatal care, the unresolved investigations — both at a state and federal level, or the big totals in its profit margins, it’s mind-boggling how this rich abortion corporation can keep deceiving the American public into thinking defunding it will hurt women. Defunding Planned Parenthood will only help women, families, and a whole lot of preborn babies.